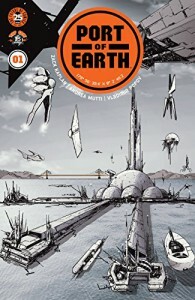 The premise behind this comic collection is that, in the future, Earth strikes a deal with an alien corporation to exchange water for technology via the title – the Port of Earth. Aliens are not supposed to leave the port but things do not turn out as planned as corporations allow a lot of leeway. I don't know if this is only a first volume as it ends controversially. A few characters are introduced and fleshed out. The end result is an engaging and exciting story with reasonable artwork (not always clear in the digital version).